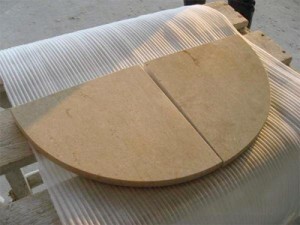 Wholesale Travertine Corner Caddies Importer in the U.S. Buyers today are looking for the extra touches that make a home more luxurious. When you anticipate their needs and include those little finishes, it makes a great impression on potential clients. In addition to using natural stone where you can, including in window sills and stairwells, you also might want to consider incorporating travertine corner caddies into key areas of the project. Consider these benefits of natural stone corner caddies as well as these clever design ideas. People want their homes to look great, but they aren’t necessarily interested in making their property harder to care for. The right building materials will ensure that properties are easy to maintain as well as attractive. Travertine has been a popular building material for centuries because it’s very easy to clean and care for. In general, it can be scrubbed down with mild detergent and water. Annual sealing will keep the pores closed and prevent staining. All in all, it proves more convenient than wood and other building materials. In the past, showers came with a basic little soap dish that held a washcloth and bar of soap. With so many people making the switch to liquid soaps and loofah sponges, these fixtures are falling out of fashion. While they’re an ordinary fixture found in many homes, you can make your project stand out more by eliminating this basic piece and adding a more sophisticated corner shelf. The travertine is more attractive than basic ceramic soap holders, and the flat shelf will prove more useful for modern homebuyers. The colors are sophisticated, and moving the shelf out to the corner will effectively open up space along the center of the tub. All in all, you’re replacing a basic fixture with an elegant one that will add a special touch to the room and make any space more attractive. Most people find that a single shelf in the shower just isn’t enough. This is why manufacturers offer all kinds of pressure mounted and hanging shelves for the bathroom. However, you can keep any powder room looking clean by adding more corner shelves. While one in the corner looks great, you can balance the appearance by putting another one in the opposite corner. Another option is to stack them in a row at one end of the bathroom to add multiple shelves while maintaining the neat look. Your customers can decide how many are necessary and when the configuration should be to allow them to further customize their home to suit their needs. People are often surprised to realize that travertine can be used in exterior applications. This makes it the perfect choice when you want to add some shelves to an outdoor kitchen or a spa area needs more storage. The shelves can be installed along the interior corner of two adjoining walls, so you can get creative with the exterior placement. If you’re installing an outdoor bar, consider adding a few corner shelves along the back wall for displaying items or storing bottles. If the front door of a home is recessed into an alcove, you can finish off the alcove with brick or tiles and add a few corner shelves. Decorate them with seasonal items throughout the year to make the front of a property more inviting and welcoming. Another benefit of travertine is the lovely neutral colors. Available in shades of tan with white and gray mottling, travertine will match almost any type of décor. Rather than giving your project a finish of pure white tiles that may not match their décor, they can benefit from a neutral look that matches contemporary and traditional themes alike. This gives customers a finished arrangement that will never become outdated or need to be replaced. Homeowners who are making a purchase for the long term will love knowing that their bathroom will continue to be in fashion for decades to come because you had the foresight to go with travertine finishes. Another concern of any builder is the safety of potential customers. You want the people who buy your homes to be safe in the property now and for years to come. Unlike other storage options, the travertine corner caddy doesn’t have sharp edges that people might bump into. The smooth curve makes a gentle transition from one wall to the other, effectively eliminating sharp angles. In addition to being a safer choice, it also looks more attractive than other options. Corner shelves aren’t just useful in the bathroom. They’re also the perfect addition to most kitchens. If you have an interior corner, then consider adding a shelf to help keep the counters clean at all times. This is particularly useful along windows where you don’t want to take the cabinets right to the wood structure. Adding corner shelves allows you to make the transition from the cabinet to the window while also adding storage space to the room. They may also be added in the area around the stove to get things off the counter while making a smoother transition from nearby cabinet to the backsplash. The corner caddies are also a great finishing touch along the bathroom vanity. Install one in the corner right below the mirror. People will love having a place to set their toothbrush holders, perfume bottles or other items. They may choose to put a decorative item on this shelf or something more functional, and they’ll be impressed with your attention to detail either way. You can also add the corner shelves to the area over the commode or other spots in the bathroom to help tie the décor together and improve the storage. When you’re working on a series of new houses or a hospitality project, make the right impression by choosing natural stone wherever you can. In addition to using travertine or marble for the flooring, you can also use this material for shower caddies in the bathroom. Place a bulk order with StonExchange and save on these important fixtures. Your customers will be impressed with your attention to detail, and we hope that you’ll be impressed with our great customer service and wholesale prices. We have an excellent selection of natural stone tiles and accessories, and we take pride in our wholesale pricing. Our orders are filled out of our Miami warehouse, and we provide prompt shipment throughout the United States.